Today’s blog post is the long-awaited tutorial on real-time drowsiness detection on the Raspberry Pi! Back in May I wrote a (laptop-based) drowsiness detector that can be used to detect if the driver of a motor vehicle was getting tired and potentially falling asleep at the wheel. The driver drowsiness detector project was inspired by a conversation I had with my Uncle John, a long haul truck driver who has witnessed a more than a few accidents due to fatigued drivers. …but the method was not optimized for the Raspberry Pi! Since then readers have been requesting me to write a followup blog post that covers the necessary optimizations to run the drowsiness detector on the Raspberry Pi. I caught up with my Uncle John a few weeks ago and asked him what he would think of a small computer that could be mounted inside his truck cab to help determine if he was getting tired at the wheel. He wasn’t crazy about the idea of being monitored by a camera his entire work day (and I don’t necessarily blame him either — I wouldn’t want to be monitored all the time either). But he did eventually concede that a device like this, and ideally less invasive, would certainly help avoid accidents due to fatigued drivers. 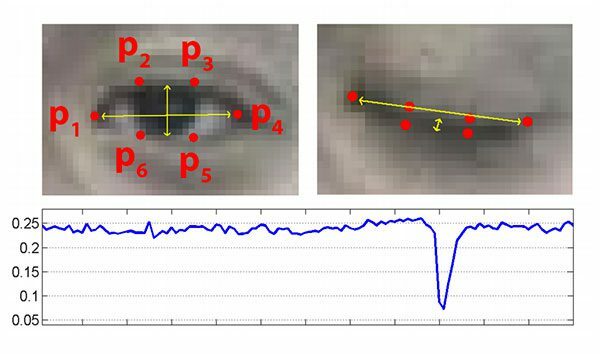 To learn more about these facial landmark optimizations and how to run our drowsiness detector on the Raspberry Pi, just keep reading! Discussing the tradeoffs between Haar cascades and HOG + Linear SVM detectors. Examining the TrafficHAT used to create the alarm that will sound if a driver/user gets tired. Implementing dlib facial landmark optimizations so we can deploy our drowsiness detector to the Raspberry Pi. Viewing the results of our optimized driver drowsiness detection algorithm on the Raspberry Pi. Before we get started I would highly encourage you to read through my previous tutorial on Drowsiness detection with OpenCV. While I’ll be reviewing the code in its entirety here, you should still read the previous post as I discuss the actual Eye Aspect Ratio (EAR) algorithm in more detail. The EAR algorithm is responsible for detecting driver drowsiness. The major optimization we need to run our driver drowsiness detection algorithm on the Raspberry Pi is to swap out the default dlib HOG + Linear SVM face detector and replace it with OpenCV’s Haar cascade face detector. While HOG + Linear SVM detectors tend to be significantly more accurate than Haar cascades, the cascade method is also much faster than HOG + Linear SVM detection algorithms. Read this post on Histogram of Oriented Gradients and Object Detection where I discuss the pros and cons of HOG + Linear SVM and Haar cascades. Work through the PyImageSearch Gurus course where I demonstrate how to implement your own custom HOG + Linear SVM object detectors from scratch. Ensure the drowsiness detection algorithm would run in real-time due to the faster hardware. Use the laptop speaker to sound an alarm by playing a .WAV file. …but the Raspberry Pi is a highly versatile piece of hardware that includes a large array of hardware add-ons. Figure 1: The Raspberry Pi 3 with TrafficHat board containing button, buzzer, and lights. This kit is an excellent starting point to get some exposure to GPIO. If you’re just getting started as well, be sure to take a look at the TrafficHat. You don’t have to use the TrafficHAT of course; any other piece of hardware that emits a loud noise will do. Another approach I like to do is just plug a 3.5mm audio cable in the audio jack, and then set up text to speech using espeak (a package available via apt-get ). Using this method you could have your Pi say “WAKEUP WAKEUP!” when you’re drowsy. I’ll leave this as an exercise for you to implement if you so choose. However, for the sake of this tutorial I will be using the TrafficHAT. You can buy your own TrafficHAT here. And from there you can install the required Python packages you need to use the TrafficHAT via pip . But first, ensure you’re in your appropriate virtual environment on your Pi. I have a thorough explanation on virtual environments on this previous post. Note: I’ve made the assumption that the virtual environment you are using already has the above packages installed in it. My cv virtual environment has NumPy, dlib, OpenCV, and imutils already installed, so by using pip to install the RPi.GPIO and gpiozero to install the respective GPIO packages, I’m able to access all six libraries from within the same environment. You may pip install each of the packages (except for OpenCV). 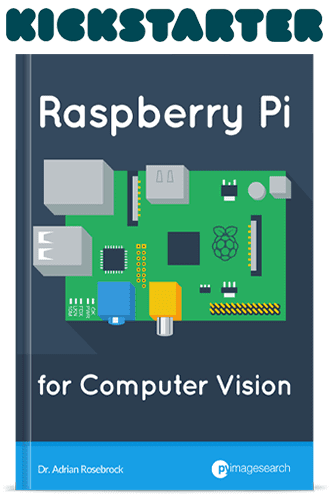 To install an optimized OpenCV on your Raspberry Pi, then just follow this previous post. If you are having trouble getting dlib installed, please follow this guide. The driver drowsiness detection algorithm is identical to the one we implemented in our previous tutorial. To start, we will apply OpenCV’s Haar cascades to detect the face in an image, which boils down to finding the bounding box (x, y)-coordinates of the face in the frame. 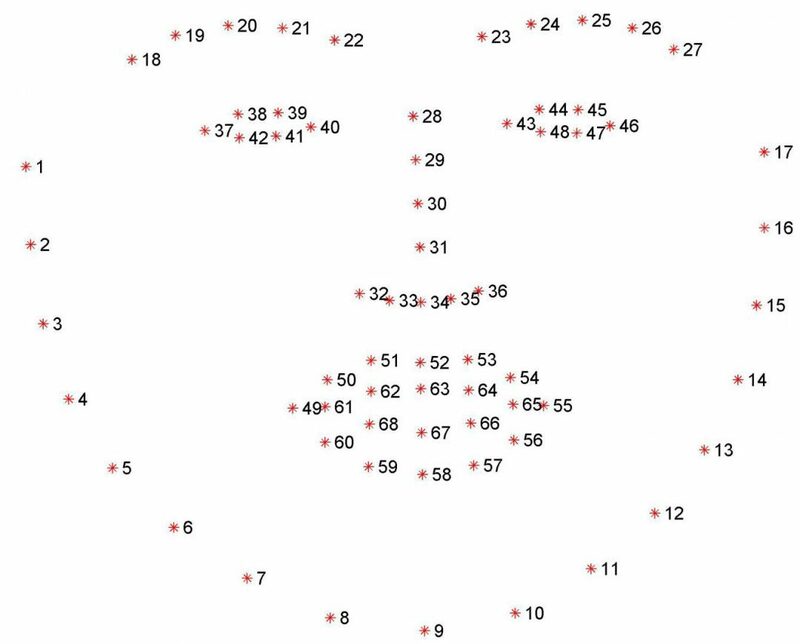 Figure 2: Visualizing the 68 facial landmark coordinates from the iBUG 300-W dataset. As I discuss in this tutorial, dlib’s 68 facial landmarks are indexable which enables us to extract the various facial structures using simple Python array slices. Figure 3: Top-left: A visualization of eye landmarks when then the eye is open. Top-right: Eye landmarks when the eye is closed. Bottom: Plotting the eye aspect ratio over time. The dip in the eye aspect ratio indicates a blink (Image credit: Figure 1 of Soukupová and Čech). On the top-left we have an eye that is fully open and the eye facial landmarks plotted. Then on the top-right we have an eye that is closed. The bottom then plots the eye aspect ratio over time. As we can see, the eye aspect ratio is constant (indicating that the eye is open), then rapidly drops to close to zero, then increases again, indicating a blink has taken place. You can read more about the blink detection algorithm and the eye aspect ratio in this post dedicated to blink detection. 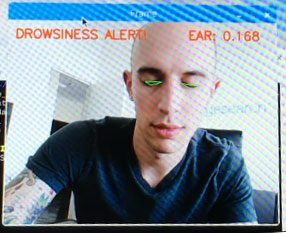 In our drowsiness detector case, we’ll be monitoring the eye aspect ratio to see if the value falls but does not increase again, thus implying that the driver/user has closed their eyes. Figure 4: Me with my eyes open — I’m not drowsy, so the Eye Aspect Ratio (EAR) is high. Figure 5: The EAR is low because my eyes are closed — I’m getting drowsy. Figure 6: My EAR has been below the threshold long enough for the drowsiness alarm to come on. In the next section, we’ll implement the optimized drowsiness detection algorithm detailed above on the Raspberry Pi using OpenCV, dlib, and Python. Lines 1-9 handle our imports — make sure you have each of these installed in your virtual environment. On Lines 11-14 we define a convenience function for calculating the Euclidean distance using NumPy. Euclidean is arguably the most well known and must used distance metric. The Euclidean distance is normally described as the distance between two points “as the crow flies”. The return value will be approximately constant when the eye is open and will decrease towards zero during a blink. If the eye is closed, the eye aspect ratio will remain constant at a much smaller value. --cascade : The path to the Haar cascade XML file used for face detection. --shape-predictor : The path to the dlib facial landmark predictor file. --alarm : A boolean to indicate if the TrafficHat buzzer should be used when drowsiness is detected. Both the --cascade and --shape-predictor files are available in the “Downloads” section at the end of the post. As shown in Lines 43-46 if the argument supplied is greater than 0, we’ll import the TrafficHat function to handle our buzzer alarm. The two constants on Lines 52 and 53 define the EAR threshold and number of consecutive frames eyes must be closed to be considered drowsy, respectively. Then we initialize the frame counter and a boolean for the alarm (Lines 57 and 58). Line 64 differs from the face detector initialization from our previous post on drowsiness detection — here we use a faster detection algorithm (Haar cascades) while sacrificing accuracy. Haar cascades are faster than dlib’s face detector (which is HOG + Linear SVM-based) making it a great choice for the Raspberry Pi. There are no changes to Line 65 where we load up dlib’s shape_predictor while providing the path to the file. Here we supply array slice indexes in order to extract the eye regions from the set of facial landmarks. If you are using the PiCamera module, be sure to comment out Line 74 and uncomment Line 75 to switch the video stream to the Raspberry Pi camera. Otherwise if you are using a USB camera, you can leave this unchanged. We have one second sleep so the camera sensor can warm up. The beginning of this loop should look familiar if you’ve read the previous post. We read a frame, resize it (for efficiency), and convert it to grayscale (Lines 83-85). Then we detect faces in the grayscale image with our detector on Lines 88-90. Line 93 begins a lengthy for-loop which is broken down into several code blocks here. First we extract the coordinates and width + height of the rects detections. Then, on Lines 96 and 97 we construct a dlib rectangle object using the information extracted from the Haar cascade bounding box. From there, we determine the facial landmarks for the face region (Line 102) and convert the facial landmark (x, y)-coordinates to a NumPy array. Utilizing the indexes of the eye landmarks, we can slice the shape array to obtain the (x, y)-coordinates each eye (Lines 107 and 108). We then calculate the EAR for each eye on Lines 109 and 110. Soukupová and Čech recommend averaging both eye aspect ratios together to obtain a better estimation (Line 113). We can visualize each of the eye regions on our frame by using cv2.drawContours and supplying the cv2.convexHull calculation of each eye (Lines 117-120). These few lines are great for debugging our script but aren’t necessary if you are making an embedded product with no screen. On Line 124 we check the ear against the EYE_AR_THRESH — if it is less than the threshold (eyes are closed), we increment our COUNTER (Line 125) and subsequently check it to see if the eyes have been closed for enough consecutive frames to sound the alarm (Line 129). If the alarm isn’t on, we turn it on for a few seconds to wake up the drowsy driver. This is accomplished on Lines 136-138. Optionally (if you’re implementing this code with a screen), you can draw the alarm on the frame as I have done on Lines 141 and 142. That brings us to the case where the ear wasn’t less than the EYE_AR_THRESH — in this case we reset our COUNTER to 0 and make sure our alarm is turned off (Lines 146-148). If you’re integrating with a screen or debugging you may wish to display the computed eye aspect ratio on the frame as I have done on Lines 153 and 154. The frame is displayed to the actual screen on Lines 157 and 158. The program is stopped when the ‘q’ key is pressed on a keyboard (Lines 157 and 158). You might be thinking, “I won’t have a keyboard hooked up in my car!” Well, if you’re debugging using your webcam and your computer at your desk, you certainly do. If you want to use the button on the TrafficHAT to turn on/off the drowsiness detection algorithm, that is perfectly fine — the first reader to post the solution in the comments to using the button to turn on and off the drowsiness detector with the Pi deserves an ice cold craft beer or a hot artisan coffee. Finally, we clean up by closing any open windows and stopping the video stream (Lines 165 and 166). To run this program on your own Raspberry Pi, be sure to use the “Downloads” section at the bottom of this post to grab the source code, face detection Haar cascade, and dlib facial landmark detector. I didn’t have enough time to wire everything up in my car and record the screen while as I did previously. It would have been quite challenging to record the Raspberry Pi screen while driving as well. Instead, I’ll demonstrate at my desk — you can then take this implementation and use it inside your own car for drowsiness detection as you see fit. Figure 7: My desk setup for coding, testing, and debugging the Raspberry Pi Drowsiness Detector. Our Raspberry Pi 3 is able to accurately determine if I’m getting “drowsy”. We were able to accomplish this using our optimized code. Disclaimer: I do not advise that you rely upon the hobbyist Raspberry Pi and this code to keep you awake at the wheel if you are in fact drowsy while driving. The best thing to do is to pull over and rest; walk around; or have a coffee/soda. Have fun with this project and show it off to your friends, but do not risk your life or that of others. How do I run this program automatically when the Pi boots up? This is a common question I receive. I have a blog post covering the answer here: Running a Python + OpenCV script on reboot. 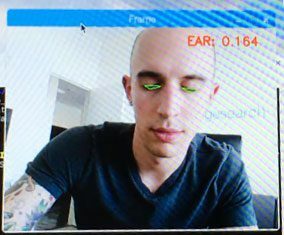 In today’s blog post, we learned how to optimize facial landmarks on the Raspberry Pi by swapping out a HOG + Linear SVM-based face detector for a Haar cascade. Haar cascades, while less accurate, are significantly faster than HOG + Linear SVM detectors. Given the detections from the Haar cascade we were able to construct a dlib.rectangle object corresponding to the bounding box (x, y)-coordinates in the image. This object was fed into dlib’s facial landmark predictor which in turn gives us the set of localized facial landmarks on the face. From there, we applied the same algorithm we used in our previous post to detect drowsiness in a video stream. To be notified when new blog posts are published here on the PyImageSearch blog, be sure to enter your email address in the form below — I’ll be sure to notify you when new content is released! Great article! Do you plan an article (or series) on low light environment face/eye blink detection. Followed your guide recently, but really excited to know how to raise the detection quality on low-light environments/low quality video stream. It’s always easier to write code for (reliable) computer vision algorithms for higher quality video streams than try to write code that compensates for a poor environment. If you’re running into situations where you are considering writing code for a poor environment I would encourage you to first examine the environment and see if you can update to make it higher quality. Due to business requirements I can’t force our clients to shot themselves only in good-to-process conditions. They could be using our software anywhere they want, so… I’d like to read of any approaches available to solve this problem. Just as an idea for you for future publications. Other readers have suggested infrared cameras and infrared lights. I would expect that solution to solve the problem when it is dark outside. There are other “poor conditions” such as reflection and glare which you would need to overcome too. This blog post will get you started but it isn’t intended to be a solution that you can sell. hi,I am chinese,I like your essay. Do you know TrafficHAT,Buy link invalidation. Can you use raspberry pi to write an article about face recognition using tensorflow, opencv, Dlib? sir, im getting problem with — cascade path… plz resolve issue asap. It sounds like you’re struggling with command line arguments. Make sure you read this post first. In this post from May ’17 about running dlib on a raspberry pi, you mention that a Raspberry Pi3 is not fast enough to do dlib’s face landmark detection in realtime. Since the drowsiness detection also uses dlib’s face landmarks, does it have similar performance issues as you mention in your older post? Or have you figured out some optimizations for RPi3 to improve performance? Hi Rohit — please see the section entitled “Haar cascades: less accurate, but faster than HOG”. This is where our big speedup comes from. Logitech webcam is better than Pi camera? It depends on how you define “better”. What is your use case? How do you intend on deploying it? Both cameras can be good for different reasons. The Raspberry Pi camera module is cheaper but the Logitech C920 is technically “better” for many uses. It is nice being able to connect the camera directly to the Pi though. Hey Arash — I actually wrote the original drowsiness detection tutorial way back in May. Secondly, I tend to write blog posts 2-3 weeks ahead of time before they are actually published. I’m not sure what your point is — you would prefer I note publish tutorials? Can you share the source codes ? is this c++ using dlib in Rapberry Pi and 30 fps ? is it around 1280×960 . resolution ? How to download updated imutils? If you are using a Python virtual environment please make sure you activate it before installing/upgrading. As always a great job !! I tested with webcom and verified a great performance in the identification of drowsiness, with a processing load of 70%. Perhaps there is something that can be improved to reduce PLOAD, perhaps by altering Haarcascade, perhaps by using the one haarcascade_eye.xml or similar, targeting only the eye area. I wanted you to share your opinion with us. Can you comment on the subject? In order to apply drowsiness detection we need to detect the entire face — this enables us to localize the eyes. We could use a Haar cascade to detect eyes but the problem is that we need to train a facial landmark detector for just the eyes. That wouldn’t do much to improve processing speed. I’m impressed with the tutorial! Please let me know what Operating System used in the Raspberry Pi 3. Hi Raghu — Raspbian is the official operating system and the one used. You can download it here. First thank you for sharing this great edition !! Thank you Marvin — you are correct. I’ve updated the post, and I’ll update the download soon. Thanks for bringing this to my attention. I have now updated the code download as well. Thanks again! Your original article used something like HOG+SVM and a sliding window for detection. 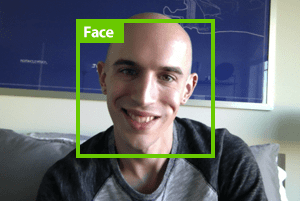 I got to say, that face detector that you have provided does work most of the time (~75%). However, doesn’t RCNN (or faster RCNN etc,whatever you get the point) just work better than pre-deep learning techniques? I mean,that’s what Justin from stanford claims (https://www.youtube.com/watch?v=nDPWywWRIRo&index=11&list=PL3FW7Lu3i5JvHM8ljYj-zLfQRF3EO8sYv&t=1950s). Is that really the case? If so, when should I NOT prefer RCNN & Why? RCNN-based methods will be more accurate than both Haar cascades and/or HOG + Linear SVM (provided the network is properly trained and deployed). The problem can be speed — we need to achieve that balance on the Raspberry Pi. Cool, thx for the answer. Just another thing: Does RCNN require more training data as well? I mean, it requires a bounding box for each object for each picture. HOG+SVM requires negative and positive examples, and for the false positives, we need to manually tell the learning algo that those are false positives. So,in your experience, which learning algo requires more training data to work decently? It will vary on a dataset to dataset basis, but in general, you can assume that your CNN will need more example images. Just started Image processing and sounds like fun but really tired of installing libraries, I have been “setting” up my pi for about a week now. Stuck on pip install scipy. running setup.py bdist_wheel for scipy … takes forever. Hi Muhammad — yes setting up the Pi can be quite frustrating. For some of the PIP installs you must be patient and let the Pi finish. 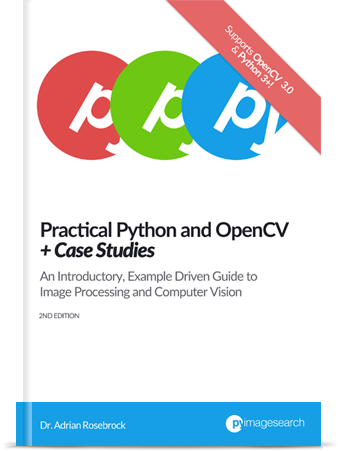 If you’re interested in a pre-configured and pre-installed Raspbian image, it comes with the Quickstart and Hardcopy Bundles of my book, Practical Python and OpenCV + Case Studies. I think it is now time to use cnn based algorithms for face detection part. Is it slow?! not anymore. You can make an awesome binarization model method tutorial in your website which face detector part would be more accurate and faster. Let me know if you need help. Hi Majid — thanks for the suggestion. Enjoy your conference! I am a university student (not in computer field) and I have interest in face detection with many methods but I have a less information about cnn-based methods.Would you mind to show me the name of the paper about cnn-based for face detection in ICCV17 (or maybe not in that conference) or relate paper in this topic. Recently I came to know about thin client. Can you please tell me the difference between thin client and a Pi with a SD card. Is there any additional memory support?. Is it possible to connect a thin client with a portable display?(7”). Please reply. Hi Suganya, see this information about thin clients. Basically thin clients rely on a server for storage and applications. You don’t store or process much locally on a thin client. A Raspberry Pi is not a thin client, but I suppose you could make it into one. Raspberry Pis (at least the Raspbian OS), allow for processing and storage on the device — it’s a fully functional small computer. Yes, you can attach a display to a thin client. I’m a high school student and I would like to reproduce your project for my science class and try some variables of my own. I wonder what camera and other equipments did you use for this experiment. Would it be possible to specify? If you want, I can share with you the results of my experiment at the end of my project. Hi Fred, thanks for the comment. It’s great to hear you are interested in computer vision! I was in high school as well when I first got into image processing. The camera for this tutorial doesn’t matter a whole lot. I like the Raspberry Pi camera module but it might be easier for you to use the Logitech C920 which is plug-and-play compatible with the Raspberry Pi. For this specific blog post I used the Logitech C920. I’ll give it a try and let you know how far I can get. in which folded should I extract the zip file? I think I got everything else ready now for my testing. It doesn’t matter where you download and extract the .zip file. Extract it, change directory into it, and execute the script. Hi Adrian, i run the code, but its very slowly. What is the problem ? Hi Hien — what type of system are you executing the code on? What are the specs of the machine? Hi adrian. If i use a night vision cam, do i need change the code? You might have to. I would verify that faces can still be detected and the facial landmarks localized when switching over to the night vision cam. Hello Adrian. I am a student and want to make this as my project .Traffic hat is not available so I’m planning on using the 3.5mm audio jack on playing the alarm. Im really a newbie in image processing. The part of the codes in replacing the alarm really confuses me. Can you help me out in replacing the codes instead of using traffic hat? Thank you. Hi Liz — congrats on working on your project, that’s fantastic. I haven’t used the audio jack or associated audio libraries on a Raspberry Pi so unfortunately I can’t give any direct advice. But in general you’ll need to remove all TrafficHat imports and then play your audio file on Lines 136-138. If you’re new to computer vision and OpenCV I would suggest you work through Practical Python and OpenCV. I created this book to help beginners and it would certainly help you get quickly up to speed and complete your project. Hello, thanks for the comment. Can you be a bit more specific when you say “run the project when Raspberry is opened”? Are you referring to running the project on reboot? Secondly, I’m not sure what you mean by “add .xml and .dat files to code”? You are trying to hardcode the paths to the files in the code? If you are using a buzzer you should read up on GPIO and the Raspberry Pi. You should also consult the manual/documentation for your particular buzzer. You can hardcode the paths to the XML file if you so wish. Just create a variable that points to the paths. Or you can execute the script at boot and include the full paths to the XML files as command line arguments. Either method will work. For more information on running a script on reboot, take a look at this blog post. Dr Rosebrock, thank you so much. I ran the project. Your article was very useful. ( for buzzer…… buzzer + pin = raspbbery 29 pin, buzzer – pin = raspberry 25 pin gnd). I can send a video for work ..
Yorulmaz can you please send me the code with this buzzer implementation. Swathi can you please send me the buzzer implemented code. Would testing for a yawn follow a similar approach??? Thanks. Yes, monitoring the aspect ratio of the mouth would be a reasonable method to detect a yawn. The only problem is occlusion (when the hand moves in front of the mouth) or if the user is singing a song. I think one might need to use a deep learning training and classification approach. Thoughts? Deep learning might be helpful but it could also be overkill. If a hand, coffee cup, or breakfast sandwich moves in front of the mouth, I’m not sure that matters provided it’s only an occlusion for a short period of time. I doubt many people yawn once and then immediately fall asleep unless they have a specific condition. A more robust drowsiness detector should involve sensor fusion, such as body temperate, heart rate, oxygen levels, etc. this error is shown when i run it, please help… i did not change anything from the code. Make sure you use the “Downloads” section of this blog post to download the source code. It looks like you formatted the code incorrectly when copying and pasting. I’m impressed with your Drowsiness Detection algorithm for Raspberry Pi. why don’t you develop the algorithm for iOS and Android phones so that it would reduce the cost of buying Raspberry Pi. what is the dlib face landmarks detection speed on raspberry pi when people number is big(about 10)? The facial landmark detector is extremely fast, it’s the face detection that tends to be slow. It really depends on what your goal is. Are you trying to apply drowsiness detection to all ten people in the input frame? I have a question. As I reviewed your code in my raspberry and more or less there are 5 frames per second. And in your video you can see the photoprograms much faster. Maybe there is some way to take more frames per second? Just to clarify — did you use my code exactly (downloaded via the “Downloads” form of this blog post)? Did you make any modifications? It would also be helpful to know which model of the Raspberry Pi you are using. I tried to use the same code in the above, but i have the problem in installing the dlib in my windows.can you please tell how to install that in windows.I download dlib package directly from net but its not working. Hi Adrian, Thank you very much. I run the code which download from this blog on raspberry pi3 model B(raspbian stretch), but its very slowly. What is the problem ? I followed blogs to install opencv3 and dlib on my raspberry pi3 ( optimizing opencv on raspberry pi and install dlib ( the easy, complete guide ) ). Can you elaborate on what you mean by “slowly”? Are you using a Raspberry Pi camera module or a USB camera? Additionally, how large are the input frames that you are processing? Make sure you are using the Haar cascades for face detection rather than the HOG + Linear SVM face detector provided by dlib. This will give you additional speed as we do in this blog post. Thanks for your sharing. I have the same problem as zjfsharp. I did exactly as the post (with optimizing opencv installed )and ran the downloaded and unchange code in my raspberry pi3 model B successfully. But the fps is around 4. The operating system is raspbian stretch lite with GUI. while runing the code the, the cpu runs at 600MHz(half of 1.2GHz). The memory usage is about 40 percent. The result is far less smooth as your video shown above. Hey Charlie — just to clarify, how are you accessing your Raspberry Pi? Via SSH or VNC? Or via a standard keyboard + HDMI monitor setup? Additionally, are you using a USB webcam or a Raspberry Pi camera module? I’m using a usbcam(logitech em2500) via a standard Keyboard+HDMI setup to access. Low fps seems has nothing to with cpu frequency(boosted to 1.2GHz), cpu and memory usage and power supply(5v,2A). Thanks for sharing the hardware setup, Charlie. Are you using Python 2.7 or Python 3? Python 3. I’m still stuck here. Do you have any idea? Thanks for your reply. I know Python 3 handles threading and queuing slightly different than Python 2. Would you be able to try Python 2 and see if you have the same results? hello did you solve your problem charlie ? OS is Rasbian Stretch hw is raspberry pi 2. If you are getting a “NoneType” error than OpenCV cannot read the frame from your Raspberry Pi camera module or USB webcam. 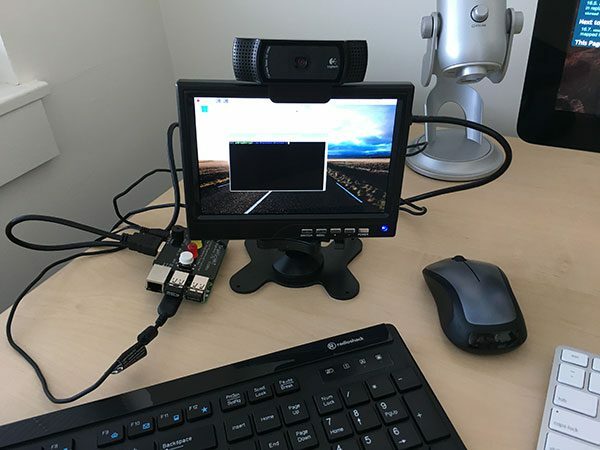 Double-check that OpenCV can access your Raspberry Pi camera by following this post. Additionally, you should read up on NoneType errors and how to debug them here. hi Adrian, I have confirmed that the camera captures video and photos as I followed ur previous camera setup tutorial. however, I’m having exactly the same error with Emre. Im using raspberry pi camera for my project. what should I do?. any other idea? using “Raspberry Pi camera module” not a USB one. But it did not work at all. Can you help me out? See this tutorial on running a script on reboot. You’ll either need to access your Python virtual environment and then execute the script (best accomplished via a shell script) or supply the full path to the Python binary (which I think is a bit easier). If you’re a beginner I would suggest coding directly on the Raspberry Pi, that way you won’t be confused on which system the code is executing on. can i put the codes inside the python shell in the virtual environment? i am having a big trouble on how to start scripting and what ide i should use and also i dont know how to run it. i am very sorry if i look dumb but i am really new to this kind of tech can someone help me? Instead of trying to use the Python shell or IDE to recommend the code, simply open up a terminal, access your Python virtual environment via the “workon” command execute the script from the terminal. There is no need to launch a shell or IDE. i am facing this error.please help. Im facing issue with the buzzer, can u help me to fix the buzzer and also share me a code, which runs with buzzer. it would be a great help. Thank you. What is the exact error/issue you are having? I’m unable to implement the buzzer to my code. can you please share a code with a buzzer, it would be really helpful. Espeak is not working properly. I’m unable to hear the sound from the buzzer, if u could provide a correct code, it would be really helpful. Thank you. Also need to know which gpio pin i should connect the buzzer for for I/O Pin. same code works on laptop very seamlessly . How are you access your Raspberry Pi? Via HDMI monitor and keyboard? Over SSH? Over VNC? It sounds like you may be using SSH or VNC. Hi Adrian , thank you for this tutorial it’s really helpful ! Take a look at this post as it demonstrates how to extract the various facial features. Once you have them you can extract individual (x, y)-coordinates as well. while I go for running the file from cmd shell it gives me so such file or directory error. The code itself doe snot need to be modified. You can resolve your error by reading up on command line arguments. Sure, I will consider this for a future tutorial. i am getting black frame screen on executing the program. pi camera led is on. But frame screen is blackout. This is likely a firmware and/or picamera version issue. I discuss how to resolve the problem in this blog post. Hi Adrian, i am wondering can be use the Dlib’s 5-point Face Landmark Detector here instead of 68 point? If so, what are the necessary changes i have to make here in this code for running it on Pi. Can you please specify or advice for the same? Also what do you think how much does it help in improving the performance in terms of speed and accuracy and memory size? No, you cannot use the 5-point model for drowsiness detection (at least in terms of this code). I discuss why you cannot use the 5-point model inside the 5-point facial landmark post. Be sure to give it a read. line 50 ans 66 are giving error ans there are some library that do not work. what can i do to solve thé problèmes. What are the exact errors that you are getting? Keep in mind that if I, or other PyImageSearch readers, do not know what problems or errors you are having we will be unable to help. When I run your code via python 3 on terminal, it gives me an attribute error on line 69. Hey Mario — what version of dlib are you using? I installed OpenCV and all the requirements from scratch by following your tutorial again, and now everything works like a charm. Thanks anyway! Awesome, I’m glad to hear it Mario! Congrats on getting OpenCV installed! Is there a reason you chose to use VideoSteam over VideoCapture to get frames? I’m trying to add code to record the video to a file using a VideoWriter object. I am having trouble getting the video to record at a regular speed video though, it seems to be in slow mode. I think it has to do with the VideoStream object getting frames. I tried recording with the VideoCapture object (in a test script) and it runs much faster. Any advice would be great! Thanks so much! Hi Eric. VideoStream is part of my own threaded implementation in imutils. I also have fileVideoStream which uses VideoCapture. Check out the source here on GitHub. When i m running this code on my raspberry pi3, th results which i m getting are with delay pf 8 to 10 seconds. Can you please suggest something to make this faster?? Dlib now has a 5-point facial landmark detector that will be significantly faster than the 68-point one. Please see this blog post introducing the 5-point detector. I have to detect drowsiness in RPi 3..Please help me to find as solution..
You cannot use the 5-point facial landmark detector to compute EAR. The 5-point facial landmark detector cannot be used for drowsiness detection. I want to make noise from 3.5mm speaker output. Should I change or delete the log? If you have no intention of using TrafficHat then delete all TrafficHat code from the file. What about Python 2.7? Does it give you the same FPS as well? You can use the “Downloads” section of this blog post to download the source code. may i ask what are the limitations of this device? and what python version are you using here? I’m not sure what you mean by “limitations”, you’ll need to be more specific as I don’t know if you’re referring to computational limitations, deployment, etc. To address your second question, I used Python 3 but this code will also work with Python 2.7. Provided you can detect the face and facial landmarks this method will work. If you cannot detect the face, such as if the face is obscured, it will not work. Technically yes, but you would need to modify the code to upload the alert to a web server first. Again, 100% possible but you would need to decide which web service you are using and then read the corresponding documentation. Sir if i used the Raspberry Pi model 3 b+ here, is there any changes in terms of peformance? The Pi 3B+ is slightly faster so you will see a small increase in speed but not a massive amount. Sir I need to implement this in dark as my project. Can you help me out with the code changes as I am not able to get the changes done. It’s unfortunately not as simple as changing a few lines of code here and there. What have you already done to get this project working in low light or no light conditions? What camera are you using? Thanks Adrian. I really enjoy this tutorial. 2. If i intend to use a buzzer instead of the traffic hat, would there be significant difference in the code you provided? 1. Exactly which database you use is really dependent on your project specifications. You should do your own research there. But typically a good first start is a SQL-based database and then go from there. 2. No, there would not be a significant change. Just swap out the TrafficHat code for the GPIO code specific to your buzzer. I am new to image processing and python as well…can u give detailed information regarding installations to carry out this project? 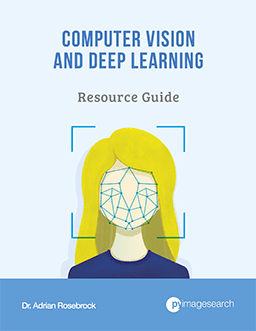 You should refer to one of my OpenCV install guides to help get you started. Your project is amazing! I would like to ask about if you had already tried using IR camera for low light conditions for detecting drowsiness? Your reply will be highly appreciated. How about sir using PI Noir Camera? Hey there Rendhel, I have not tried the code directly with a Pi Noir camera. hi adrian, Im new to IOT. I need ur clarifications. As for the traffic hat and the raspberry PI 3 , are they 2 different things or the same( PI combined with traffci hat).? u made them sound like 2 but according to your image its 1? so which is which? 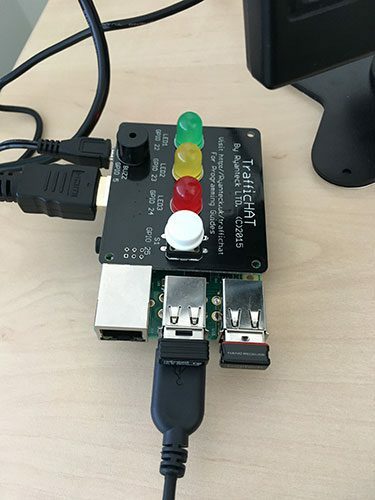 The TrafficHat is a component that connects to the Raspberry Pi itself. They are two different pieces of hardware that connect together. if i plan to use a night vision camera for this program, does anything of the code needs to be modified or can i use the same code to detect faces in low light/darkness? Potentially, but I would start by trying with the night vision camera first before you plan on making any changes. is it possible to control the volume of the trafficHat buzzer.? as in, start from low to high according to the frequency of eye closure. in other words the deeper the sleep, the louder the sound. As far as I know it’s not but you should reach out to the creators of the TrafficHat to verify. Great work as you do! But I have the same problem with Charlie. I’m using a usbcam (Logitech c920) via a standard Keyboard+HDMI setup to access. Unfortunately, when I ran this script by using Haar cascade and 68 facial landmarks with python2.7 I got a bad performance which fps is low and the speed of video stream is slow. How can I get a better performance? Hey Tim — I haven’t been able to replicate the problem that both you and Charlie have had, unfortunately. Try to debug the issue by writing a separate Python script that only pulls frames from your camera and display them to your screen. Is the lag as bad? If so, probably an OpenCV or hardware issue. If not, then you can further debug which part of the code is really slowing you down. I would instead modify the code that if “no face is detected for N frames”, where N is a value you define, then you sound the alarm. using the same system, is it possible to emit vibration when drowsiness is detected.? what extra, do i need to attach? You would need a hat for your Pi that has a vibration functionality. Does the camera you use cuts infrared? I am planning to use NoIR camera so it can be applied in low light condition. Thanks for the reply. No, I used a standard USB camera for this project but you could use a NoIR camera if you wished. will there be any to change in your set up sir Adrian? Great Work, I run the project, it’s working fine but, I don’t have the TrafficHat. instead of using TrafficHat I want to use directly gpio to operate a relay module. please suggest me in which section of the code should i change. and whice code should i put? Anywhere you see TrafficHat code you’ll want to swap that out for your GPIO code. Exactly what that code looks like is 100% dependent on which relay module you’re using, which GPIO pins you’re using, etc. Hi. I just read this article and I would like to know if it would be possible to create a program that would let the rpi automatically select between the Rpi cam or webcam if the two of them are simultaneously connected on the Raspberry pi, depending on which of the two cameras detect a face. It’s absolutely possible. Start by reading this tutorial on multiple cameras with the Pi. Each frame will need to be read and face detection applied. If a face is found, hand off the face to a separate process to perform recognition then highlight that show the stream of that camera on your desktop. Hi. I tried using three cameras.I used if-else statements to interchange between which cameras are detecting a face and then lock on that face as long as that specific camera is still detecting a face. I ran dlib facial detection on each cameras frames. However, I noticed a decrease in speed of the frames captured. The alarm triggers a little bit later than usual after detecting closed eyes. Is it because of my code or because of the facial detection function running on 3 different camera frames? I’d like to know your thought about it. You’re running face detection + recognition on 3 separate cameras? If so, that’s the issue. The Raspberry Pi just isn’t powerful enough for that. When you said from your previous comment that what I want to do is absolutely possible, does it include the slowing down of the frame capture? Or what you had in mind doesn’t really follow what i’m doing with the code? 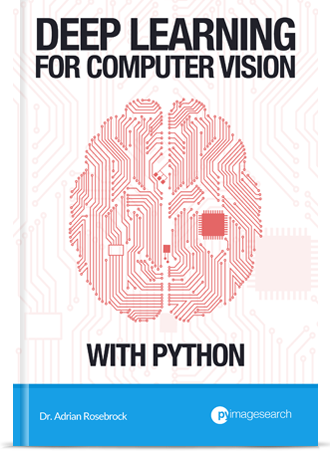 Hey Pacquier — I would suggest keeping an eye on the PyImageSearch blog for my upcoming Computer Vision + Raspberry Pi book. I’ll be covering how to optimize the Pi fo computer vision applications covering both the hardware and software side of things. It’s too much for me to address in a single comment on this post so I hope you’ll take a look at the book. I’ll be sharing more details soon. Hi Adrian，I know that the Raspberry Pi can’t do very good real-time, can you recommend a development board for better real-time performance? It actually depends on what you’re trying to do. For some applications of computer vision the Raspberry Pi can run in real-time. And in other cases you should just use the Movidius NCS to speed it up. Otherwise I recommend the Jetson TX2 if you’re interested in embedded deep learning. hy sir can it detect eye at night time or when person wearing eye site glasses? No, this method is intended for use when you can clearly detect the eye regions of the user. if we use night vision camera then its possible to do it at night? It maybe a easily-dealed problem but I just have no idea to fix it. Would you plz help me? Once again, Thanks a lot ! But I have intall imutils , how’s this happen? If you’re new to command line arguments and argparse, that’s okay, but you need to read this tutorial first. Once you read the guide you will understand how to supply the proper command line arguments to the script. Hi Adrian, I’m from the Philippines and i love your work on this. But i need help on how to sound the alarm using speakers via the audio jack since traffic hat isn’t available here in our country. Thanks! I demonstrate how to do use a speaker with the Raspberry Pi in this guide. If i want to use pi camera, do i just only comment out Line 74 and uncomment Line 75 to switch the video stream to the Raspberry Pi camera? You are correct in both counts. An infrared camera will help with the drowsiness detection at night. hi Adrian, the alarm does not sound accurately upon eye closure. sometimes I close my eyes and the alarm is not sounded(detected). like….. the accuracy is very low. what should I do to make real time? Thank you for your project. May I ask how do you power up your raspberry pi in your car? If by powerbank, what brand of powerbank do you used? Reply is very much appreciated. The Raspberry Pi Zero will unfortunately be too slow for this project. I would highly recommend you use a Pi 3. I am getting a error when we run your code sir. It is no module named cv2. But we have installed opencv using your tutorial. What should we do to clear this error sir. Unfortunately it sounds like you do not have OpenCV properly installed. You should refer to my OpenCV install guides. Which one did you follow? Make sure you refer to the “FAQ” section at the bottom of each post which explains common errors such as yours. It is not working when i put glasses so kindly tell what i can do ? This method will not work reliably with glasse. Hello Sir Adrian, can i get the full code for this project?. Hi. Thanks to this post, I am the student who completes the detection of the eyes. Thank you first. I am currently using Raspberry Pie 3b + and pi camera. First, there is source code using Haar cascades. Is there source code using HOG and LInear SVM? I’m having a problem with accuracy. Secondly, do you want to use the infrared pi camera and proceed with the same source code? Answers I’ll wait. Thank you. HOG + Linear SVM will be very slow on the Pi. If you want to try you can follow this tutorial. Hello This is a wonderful post! First, I want to use an infrared pi camera. Is there anything to modify in the source code section? Second, is there any code for HOG + Linear SVM? 1. I haven’t tested this code with an infrared camera. You would need to test it and see. 2. You mean HOG + Linear SVM for face detection? Or arbitrary object detection? Pls does anyone have an idea on how i can change the video source to be streamed in a python GUI??? I implemented the project according to the posting, but the fps is about 5-7. So I’m going to add Movidius NCS. Movidius NCS is based on caffe and tensorflow, and can it help projects in this posting? I have purchased Movidius NCS and I do not know how to do the initial setup and installation. same maintain a normal streaming speed? I would rather say, the for loop is quite fragile. Ur suggestions will really help. Hey, Can I use Infra Red web camera instead of camera used here? I haven’t tried this code with an infrared camera. Give it a try and see! I would love to know.